A race-inspired table to complete your PitStop furnished home or office! PitStop Furniture creates race-inspired furniture suitable for home and office use. 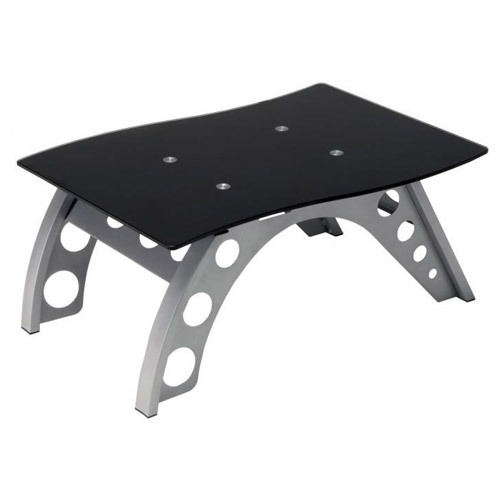 The PitStop Furniture Side Table provides you with a stylish and stable place to rest your drink, laptop, books or racing memorabilia. Use the PitStop Furniture Side Table as a standalone piece or as a companion piece to any of the PitStop Furniture Race Inspired line of quality furnishings. The PitStop Furniture Side Table features a sturdy steel-alloy base with four legs for maximum stability. A tempered glass top provides a generous surface for nearly anything that you need to keep nearby. The glass top boasts a sonic welded glass-to-base connection that prevents glass wobble, making this table more sturdy than many other models.